Thomas, Ambroise. 1 ALS, 2-face 5.25x8 / 1 signed note/receipt, Conservatoire National de Musique, October 14, 1874, 6.5x4.5 / 1 signed and inscribed note to conductor Angelo Mariani, with illustration, 7.5x11 / 1 unsigned, sepia cabinet photo, 4.5x6.5 / 1 BW photo 5x7 / Funeral announcement, Église del al Trinité, February 22, 1896, 5.75x4.75 / 2 photo postcards, 1 BW and 1 sepia, “de: Le Caid, Le Songe d’une Nuit D’Ete, Mignon” P. Nadar (80) A.N-Paris 3.5x5.5 / 1 sepia photo card, Collection Félix Potin, 1.75x3. 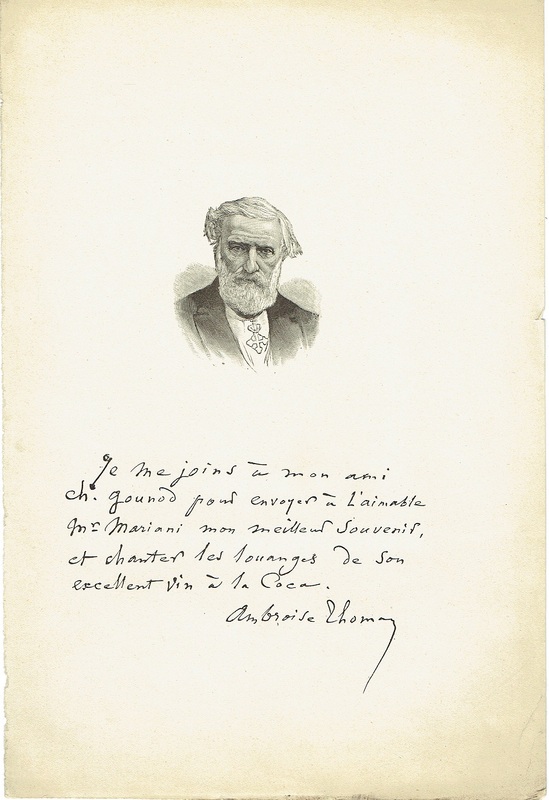 Home > Previous Auctions > Ephemera Test > Thomas, Ambroise. 1 ALS, 2-face 5.25x8 / 1 signed note/receipt, Conservatoire National de Musique, October 14, 1874, 6.5x4.5 / 1 signed and inscribed note to conductor Angelo Mariani, with illustration, 7.5x11 / 1 unsigned, sepia cabinet photo, 4.5x6.5 / 1 BW photo 5x7 / Funeral announcement, Église del al Trinité, February 22, 1896, 5.75x4.75 / 2 photo postcards, 1 BW and 1 sepia, “de: Le Caid, Le Songe d’une Nuit D’Ete, Mignon” P. Nadar (80) A.N-Paris 3.5x5.5 / 1 sepia photo card, Collection Félix Potin, 1.75x3. E00888. Thomas, Ambroise. 1 ALS, 2-face 5.25x8 / 1 signed note/receipt, Conservatoire National de Musique, October 14, 1874, 6.5x4.5 / 1 signed and inscribed note to conductor Angelo Mariani, with illustration, 7.5x11 / 1 unsigned, sepia cabinet photo, 4.5x6.5 / 1 BW photo 5x7 / Funeral announcement, Église del al Trinité, February 22, 1896, 5.75x4.75 / 2 photo postcards, 1 BW and 1 sepia, “de: Le Caid, Le Songe d’une Nuit D’Ete, Mignon” P. Nadar (80) A.N-Paris 3.5x5.5 / 1 sepia photo card, Collection Félix Potin, 1.75x3.